Children are welcome to Join the club from 8 yrs old. Initially they will begin their athletics training in our Junior Athletics Academy. Our Academy is run by official UKA Athletics Coaches who are all volunteers and give their time freely to help the youngsters achieve their ambitions. Below You will find pictures from a typical Saturday Morning Academy Session with Phil Budd and Anna Church Stone. 'The Junior Academy' trains on a Tuesday evening from 6.00pm to 7.00pm and on Saturday Mornings from 9.00am to 10.30am. Training takes place at 'The Mountbatten Centre'. Information about the track location can be found here http://www.portsmouthathletic.co.uk/find. 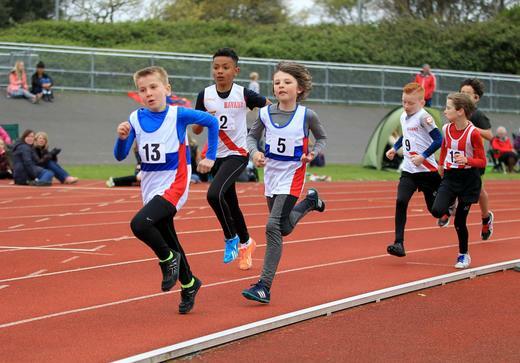 The Track league we will be competing in will be the Wessex Athletics League and this is the chance for our under 11s to get a taste of QuadKids Athletics. Quadkids is a team event of 10 Boys and 10 Girls and consists of 4 events 75m Sprint, 600m, Long Jump and Vortex Throw. The competitor will compete in all 4 events and they will receive a score for each event. At the end, all 4 scores our added up to give the athlete a total score.